Single tempered glass panel with polished edges. 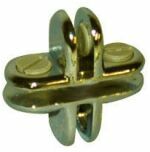 Designed to use with metal connectors. Dimensions: 10"W x 10"H x 3/16" thick. Color: clear. Single tempered glass panel with polished edges. Designed to use with metal connectors. Dimensions: 12"W x 12"H x 3/16" thick. Color: clear. Single tempered glass panel with polished edges. Designed to use with metal connectors. Dimensions: 14"W x 14"H x 3/16" thick. Color: clear. Metal glass connectors are designed to connect 3/16" thick glass panels in a secure manner at 90 degree angle. Includes plastic screws that allow easy assembly of glass displays, using a screwdriver to tighten each connector to glass panels. Color: chrome. 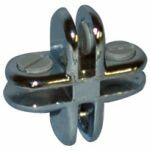 Metal glass connectors are designed to connect 3/16" thick glass panels in a secure manner at 90 degree angle. Includes plastic screws that allow easy assembly of glass displays, using a screwdriver to tighten each connector to glass panels.Color: brass. Hinges are used to make doors on cube units. Designed for 3/16" thick glass. 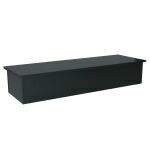 Includes plastic screws that allow easy assembly of glass displays. Color: chrome. Hinges are used to make doors on cube units. Designed for 3/16" thick glass. Includes plastic screws that allow easy assembly of glass displays. Color: brass. 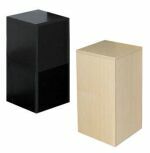 Hasps are used in conjunction with hinges to add a locking door to display cubes. Designed for 3/16" thick glass. Sold in pairs only. Lock is not included. Color: chrome. 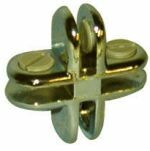 Hasps are used in conjunction with hinges to add a locking door to display cubes. Designed for 3/16" thick glass. Sold in pairs only. Lock is not included. Color: brass. Adjustable connectors allow placement of glass shelves inside an existing display cube exactly where needed. Designed to connect 3/16" thick glass. Color: chrome. Adjustable connectors allow placement of glass shelves inside an existing display cube exactly where needed. Designed to connect 3/16" thick glass. Color: brass. Adjustable connectors allow placement of glass shelves inside an existing display exactly where needed. Designed to connect 3/16" thick glass. Color: chrome. Adjustable connectors allow placement of glass shelves inside an existing display exactly where needed. Designed to connect 3/16" thick glass. Color: brass. Replacement plastic screws fit into our chrome metal glass connectors. Sold only in bags of 100 pcs. Color: grey. Replacement plastic screws fit into our brass metal glass connectors. Sold only in bags of 100 pcs. Color: yellow. Open front and open back design. Overall Glass Dimensions: 60"Long x 60"High x 12"Deep. Designed with 3/16" thick tempered glass 12" X 12", chrome connectors, base is not included. Ships unassembled and knockdown, this item requires assembly. Open front and open back design. Designed with 3/16" thick tempered glass 12" X 12", chrome connectors, base is not included. Ships unassembled and knockdown, this item requires assembly. Open front and open back design. Overall Glass Dimensions: 48"Long x 48"High x 12"Deep. Designed with 3/16" thick tempered glass 12" X 12", chrome connectors, base is not included. Ships unassembled and knockdown, this item requires assembly.. Designed with 3/16" thick tempered glass 12" X 12", chrome connectors, 30"dia white base included. Ships unassembled and knockdown, this item requires assembly. Base Color: white base. Designed with 3/16" thick tempered glass 12" X 12", chrome connectors, 30"dia base included. Ships unassembled and knockdown, this item requires assembly. Base Color: maple base. Designed with 3/16" thick tempered glass 12" X 12", chrome connectors, 30"dia base included. Ships unassembled and knockdown, this item requires assembly. Base Color: black base. Designed with 3/16" thick tempered glass 12" X 12", chrome connectors, 30"dia base included. Ships unassembled and knockdown, this item requires assembly. Base Color: cherry base. Designed with 3/16" thick tempered glass 12" X 12", chrome connectors, 30"dia base included. Ships unassembled and knockdown, this item requires assembly. Base Color: walnut base. Designed with 3/16" thick tempered glass 12" X 12", chrome connectors, 30"dia base included. Ships unassembled and knockdown, this item requires assembly. Base Color: black base (not pictured). Designed with 3/16" thick tempered glass 12" X 12", chrome connectors, 30"dia base included. Ships unassembled and knockdown, this item requires assembly. Base Color: cherry base (not pictured). Designed with 3/16" thick tempered glass 12" X 12", chrome connectors, 30"dia base included. Ships unassembled and knockdown, this item requires assembly. Base Color: walnut base (not pictured). 54"tall display designed with 3/16" thick tempered glass 12" deep shelves, chrome connectors, 54"L x 30"D x 6"H white base included. Ships unassembled and knockdown, this item requires assembly. Base Color: white. 54"tall display designed with 3/16" thick tempered glass 12" deep shelves, chrome connectors, 54"L x 30"D x 6"H maple base included. Ships unassembled and knockdown, this item requires assembly. Base Color: maple. 54"tall display designed with 3/16" thick tempered glass 12" deep shelves, chrome connectors, 54"L x 30"D x 6"H black base included. Ships unassembled and knockdown, this item requires assembly. Base Color: black. 54"tall display designed with 3/16" thick tempered glass 12" deep shelves, chrome connectors, 54"L x 30"D x 6"H cherry base included. Ships unassembled and knockdown, this item requires assembly. Base Color: cherry. 4-tiered glass display is 54"tall, designed with 3/16" thick tempered glass 12" deep shelves, chrome connectors, 54"L x 30"D x 6"H maple base included. Ships unassembled and knockdown, this item requires assembly. Base Color: maple. 4-tiered glass display is 54"tall, designed with 3/16" thick tempered glass 12" deep shelves, chrome connectors, 54"L x 30"D x 6"H black base included. Ships unassembled and knockdown, this item requires assembly. Base Color: black. 4-tiered glass display is 54"tall, designed with 3/16" thick tempered glass 12" deep shelves, chrome connectors, 54"L x 30"D x 6"H white base included. Ships unassembled and knockdown, this item requires assembly. Base Color: white (not pictured). 4-tiered glass display is 54"tall, designed with 3/16" thick tempered glass 12" deep shelves, chrome connectors, 54"L x 30"D x 6"H cherry base included. Ships unassembled and knockdown, this item requires assembly. Base Color: cherry (not pictured). Descending tiers glass display is 54"tall, designed with 3/16" thick tempered glass 12" deep shelves, chrome connectors, 60"L x 30"D x 6"H base included. Ships unassembled and knockdown, this item requires assembly. Base Color: white. Designed with 3/16" thick tempered glass 12" X 12", chrome connectors, base is not included. Ships unassembled and knockdown, this item requires assembly. Floor wood display bases made of laminated melamine. 17" quarter round x 6"H. Ships unassembled and knockdown, this item requires assembly. Colors: maple, solid white, walnut, cherry, black. Floor wood display bases made of laminated melamine. 60"L x 16"D x 6"H. Easy and ready to assemble knockdown version. Color: black. Floor wood display bases made of laminated melamine. 60"L x 16"D x 6"H. Easy and ready to assemble knockdown version. Color: maple. Floor wood display bases made of laminated melamine. 60"L x 16"D x 6"H. Easy and ready to assemble knockdown version. Color: white. Attractive oval 12" X 19" dia glass top pedestal. Adjustable in height from 32" to 48" tall. 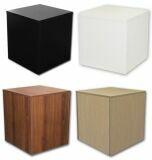 Picture shows group of 3 pedestals together. Designed for displaying handbags, shoes, jewelry, fashion accessories. 4 Level gorgeous display tower. 72"Tall X 18"W X 18"D. Each glass shelf is 16"W X 18"D. Color: dark grey.